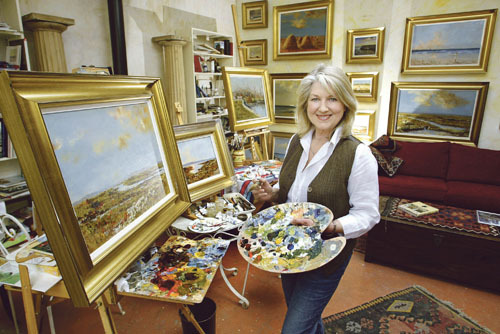 FOR YEARS Thelma Mansfield was the face of afternoon TV in Ireland, but over the last 10/15 years, she has become better known as an artist. Thelma Mansfield will host her new exhibition of oil paintings, Atlantic Light, at The Kenny Gallery, Liosbán Retail Park, Tuam Road, Galway. It will be officially opened by Mary Kennedy of RTÉ’s Nationwide on Saturday at 2pm. Ms Mansfield has a studio based in An Spidéal and much of her work is inspired by the Connemara landscape, Galway Bay, the Burren, and the Aran Islands. As an artist she is interested in capturing the mood, atmosphere, and nature of the region. The exhibition continues daily from 9am to 5pm, Mondays to Saturdays, until Christmas.